Now that the foundry has a more solid process I would like to start work on this map again... I will submit a design brief to get this map restarted. Oh wow, awesome map. And I enjoy NASCAR. Color each of the cars the same as the 8 player colors used on CC. You can then name them using their color. You can mix the pit crew order at the top so it's not listed red, green, blue, etc. from left to right. You can also code the starting pit crew positions to match the player's color. Name each car as a mod/admin group and color them with the appropriate mod colors. It provides the uniqueness of CC without having to create names. For gameplay, I think it would be worth considering aligning the Pit Equipment with the specific Car Conditions. Engine attacks Engine, Fuel attack Fuel, and Tires/Jack attack Tires. Tools can start with more neutrals than the other equipment and can attack all 3 Car Conditions. Add a Start/Finish line. Make sure that background image you used of Indianapolis Speedway is not copyrighted. Players are assigned the pit crews as starting positions. Additional track locations excluding 1 and 26 are assigned randomly. Due to the single lane around the track, I imagine that the initial couple of rounds as people grab little bonuses where possible will be crucial - once somebody is receiving more armies per turn than anybody else, the logical thing would be to build a stack until they have enough to creep around the board slowly. The only time I can see people making a "dash" for the finish line is in an escalating game with the larger cashes rolling in. Part of me would like to see a second or even third "lane" (similar to circus maximus perhaps); although you could have more sections on the outer lane (round the bends). I like it when map ideas get me brainstorming! I agree. at least 1 more lane would be very nice. MrBenn wrote: Due to the single lane around the track, I imagine that the initial couple of rounds as people grab little bonuses where possible will be crucial - once somebody is receiving more armies per turn than anybody else, the logical thing would be to build a stack until they have enough to creep around the board slowly. This raises the possibility of having a different victory objective. Perhaps holding a single lane all around the track would be practical. Also outer lanes on curves could be longer (more territories), but not adjacent to the corner territory inside the curve. If certain territories at the corners were used for lane changing, you could even have a victory condition of a path around the track that could change lanes at different points. It might be simpler just to put multiple lanes in the straightaways. Lots of possibilities down these lines, eh? I started making changed to the track but the image isn't really all that friendly to making nice clean lanes so I will be working on it this week to see what I can do with it. It's a little harder with the shape I am using vs the oval track of that gladiator map. Should have something this week. The concept of this map is very good, and is one of the few maps that I am interested to see develop. There is a mixture of opinion about how convoluted the gameplay/instructions are going to be; and there is no doubt that the gameplay is going to need a fair bit of work. Having said that, there is plenty of scope for flexibility while sticking to your vision of the players attempt to maintain their cars working condition while conquering the racetrack. How about just certain areas, like corners and the final straight, in which you can overtake? I downloaded a slotcar track designer program last evening and I think that I can use slot car lanes to show attack direction, the only problem I see thus far is that there are no 3 lane slot car tracks. But I think I can do a decent 2 or 4 lane track so I will continue looking into it for a few days and post some ideas. This way, territories on the track can attack 1 and 2 spaces ahead in their own lane, and they can attack the territory diagonally ahead in the adjacent lane (or lanes if you decide to have 3). It would be a bit more difficult to get this to work right around the corners if you have more territories around the outer lane(s). However, you might be able to get around that by saying that you can't change lanes around the steepest parts of the curves (indicated by a thick solid line between the lanes in those sections). I mentioned this way back when - there might be some ideas in there about how to have multiple lanes; although you don;t necessarily need to have the same number of lanes all the way around the track. The image I posted above (hand-drawn corner with horses and carriages) is to show how lanes could work around a corner - longe around the outside. In general, staggered lanes (as per the suggestion above) will be more confusing - particularly when it comes to start/finish lines. I really like this and I really hate racing!!!! Some wiggle room would definitely be good with an extra lane or partial lane! My general thought is that since players start on the Crews and the Crews can Bombard each other, this seems to make going 1st very advantageous. Sure, 26 can get the Crews, but that too seems to put too much emphasis on the Pit Crew. This way, the Pits will still be very important, but people will also focus on the track. Last edited by hahaha3hahaha on Fri Oct 26, 2018 2:34 am, edited 1 time in total. I agree that pits probably shouldn't attack or bombard each other. I will look at alternatives like the equipment. u don't have to have many lanes. two are enough. if u have any more, then the track starts to lose its shape. i also believe that u should receive no track bonuses unless u have fuel in ur car. this will give an extra reason to protect ur car instead of assaulting the pits. Being an avid racing fan I might suggest that if you want to add extra lanes, don't do it throughout the track. I'd just add a second racing line to every other corner. This will conform more to the norm of racing, and lessen the burden on you a bit. 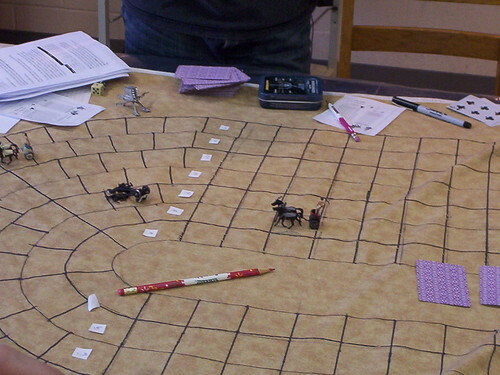 I am not sure how you will code it so you'd only need one line instead of the entire track... but I will assume that baring an escalating game you'd probably have finished off almost everyone before you get around the track. iancanton wrote: u don't have to have many lanes. two are enough. if u have any more, then the track starts to lose its shape.